Apple previously had 4K retina option available only on the 27″ models. The 21.5″ model without retina display was priced at $1099. They introduced 4K retina 21.5″ models at a price point of $1499. 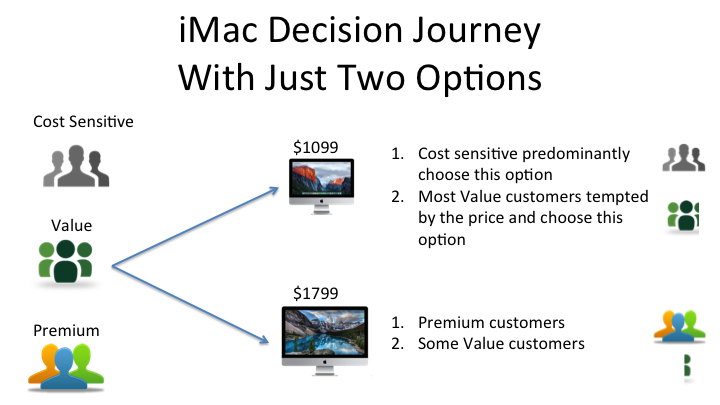 As we look closer at the price points you see the similar price fences we have seen before in iMac, iPhone and iPad models. Price fences are designed not to keep out customers but to nudge them to self-select to the version that they get most value from and deliver most profits to the business. 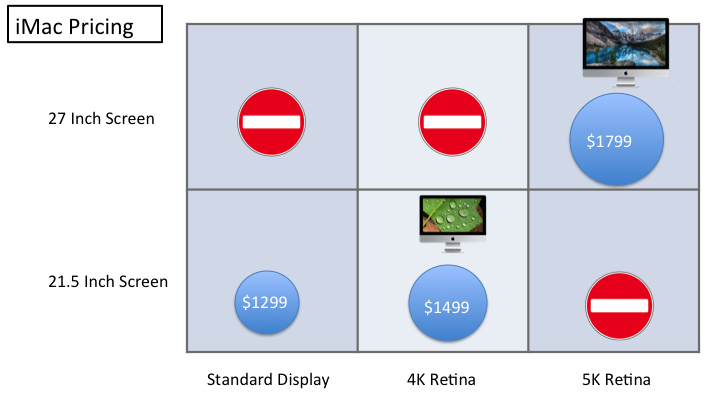 Here is my analysis of why 4K Retina on 21.5, why not 5K or why bother? Most Value customers are tempted by high value to price ratio of the lower priced model and choose it resulting in lower realized profit for Apple. The Value customers are not stuck on price. Their decision process is a journey, evaluating options at each step. 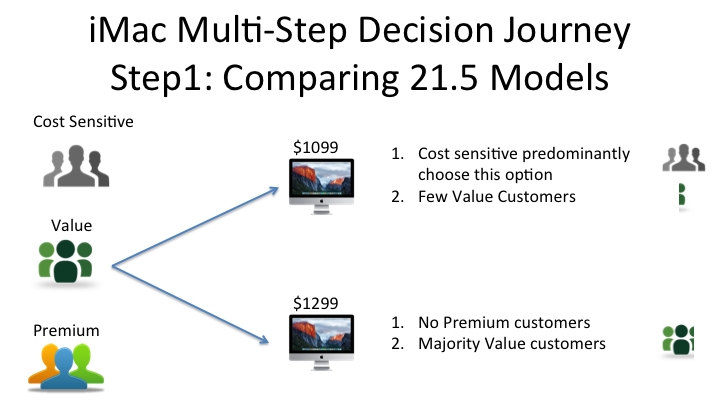 When presented better value option at each step they increasing choose value over cheaper price. 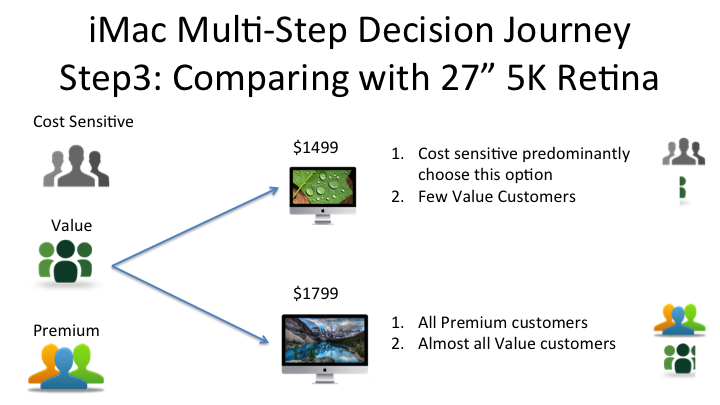 So I posit here that introduction of 21.5 inch 4K Retina display and creating separation with 5K Retina for 27-inch results in significant portion of value customers choosing the higher priced 27-inch version. 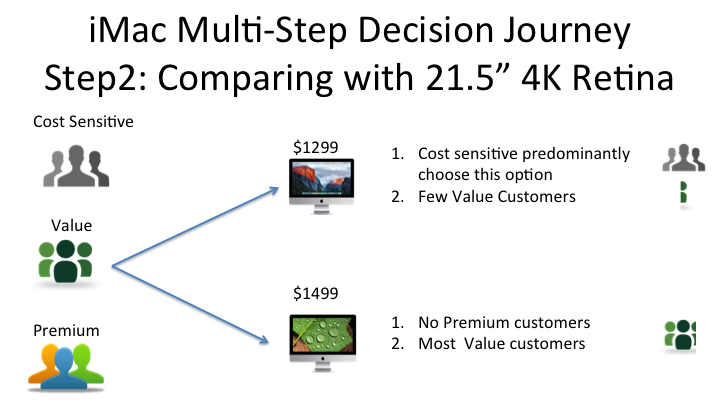 The 4K retina moves the value customer along the decision journey, allowing them to select $1799 27-inch model when compared against the $1499 21-inch model. An increase in value pie – both customers feel happy and Apple gets better profit. This is once again pricing excellence at display.